Firstly, I have been practising making my own cord. This has not been an instant triumph, but nor has it been a disaster; I just need more practice. 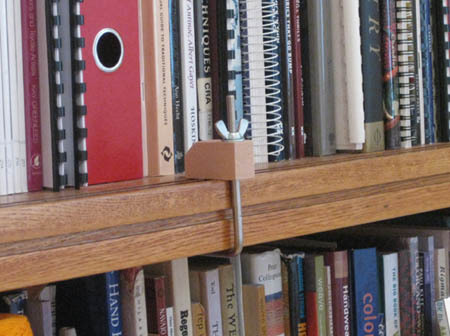 I have set myself up with a peg attached to the shelf of the dresser — those of you who have an Ashford warping frame may recognise it as one of the clamps for securing it to a table — and a hook playing the part of a drill bit in our trusty hand drill. 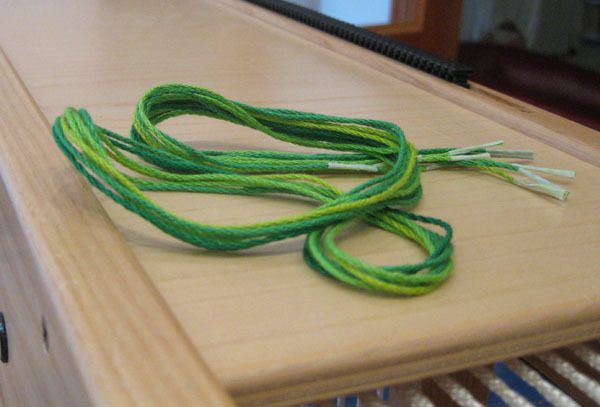 This method (taken from Peter Collingwood’s book The Techniques of Ply-Split Braiding) allows me to make a 4-ply cord that is half as long as my armspan. I have to start with a length of yarn which is twice my armspan, and therefore need to start twisting from outside the loom room, but it really does work. There are two bouts of twisting involved: first to add lots of extra twist in the direction the yarn is plied and then to ply the yarn back on itself in the opposite direction. My experience is that I tend to be too timid in the initial twist and therefore get a cord that is a little on the loose side. I think we can look forward to some over-compensation and a batch of cord plied very tightly indeed. And then, having made my cords, I have to practise splitting them. The main difficulty I have had here is a very basic one: getting the light right. Unless you are using rope, ply-splitting is quite a fiddly business and I was finding it difficult to count the twists and the plies correctly. I was angling lights this way and that, but what was right for one move would turn out to be no help at all on the next move. Then, in a completely different context, my sister-in-law mentioned headlamps and I rushed out to the shops. I now have a cheap battery-powered LED headlamp which I wear when splitting plies and it works a treat — the light is always pointing in exactly the right direction and I am never trying to work in my own shadow. I look a bit stupid* and it leaves a red dent on my forehead at the end of the evening, but these are minor tribulations. This is my first braid made from my own cords. I was trying out a different variant of the single course oblique twining (SCOT) which we learned in Albuquerque. This one involves splitting half the ends in one direction and the other half in the opposite direction; it gives the braid that V-shaped patterning. 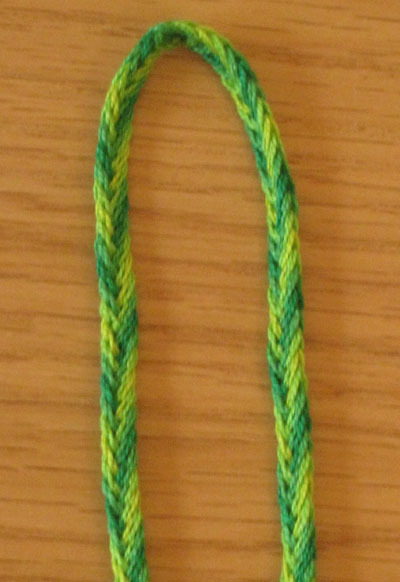 You may notice that this particular example is following a V-pattern in both its left and right tails, and that is because I changed direction at the point where the braid is folded over. My turning point needs a bit more practice, as does my photography — I did take a picture of it but it is too blurry to be of any use. Besides the ply-splitting I have also been working on drafts to use with the serious silks. This involves quite a bit of Fiberworks practice as well as some new skills. Another of my US purchases was a copy of Alice Schlein‘s book on Network Drafting, and I have found something in it that I wasn’t expecting. As you may remember (if you have a very long memory and haven’t needed it for anything else) I was learning to use the 16 shafts of my Megado. I am interested in doing more explorations of echo weave, but am not going to pursue that with these serious scarves for simple reasons of economy. Echo weave needs a dense sett and I can’t afford to use that much silk in one go! So following that logic what I really need for my silks is a lacy structure with a nice open sett, and my thoughts have turned to huck. 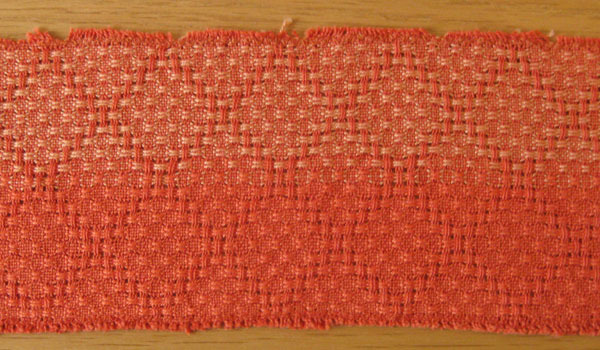 Anyway, lo and behold, in Alice’s book is a section on combining huck with plain weave in network drafted curves. 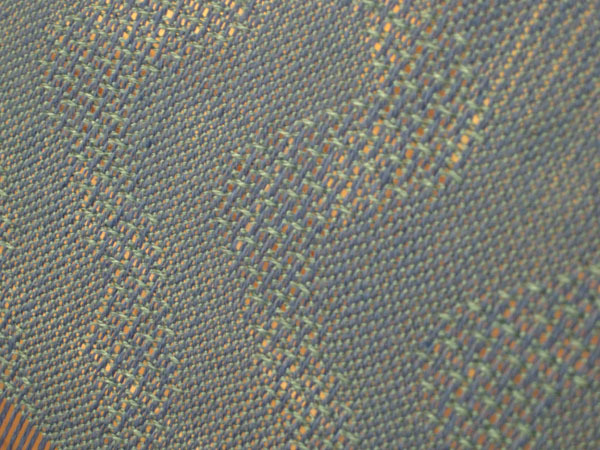 …and rethreaded the rest of the warp for some proof-of-concept samples. 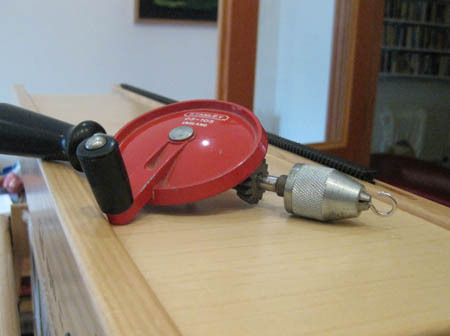 For the moment I have stuck with a straight threading (one 3-end huck unit on each of shafts 3-14 repeated 4 times) and practised cutting and pasting the treadlings together. Thanks to the templates in the book this was a real cut and paste job with scissors and glue, and then I entered it into the computer to smooth out the join between treadling repeats. I ended up using 78 dobby bars for this pattern and I have observed an Interesting Thing. The twill curves above had a repeat of 64 lifts, and the dobby seemed to be labouring, although I thought this was because I had been away from it for several weeks and the tension might be off. No amount of twiddling fixed it, however. Now I have the 78 bars, which make a chain that is slightly too long and rests on the floor, and the dobby is clicking over perfectly. I thought the floor issue might cause a problem, but in fact the 64 must have been just a bit too heavy without some extra support. 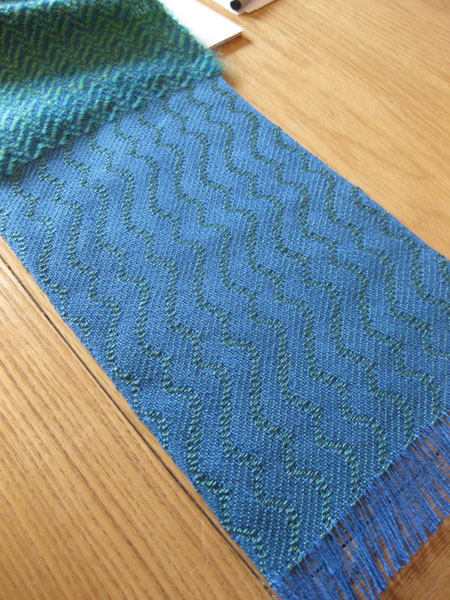 Anyway, while I do trust the guidance of More Experienced Weavers, it makes such a difference to see for myself how the draft works and how the various elements fit together. 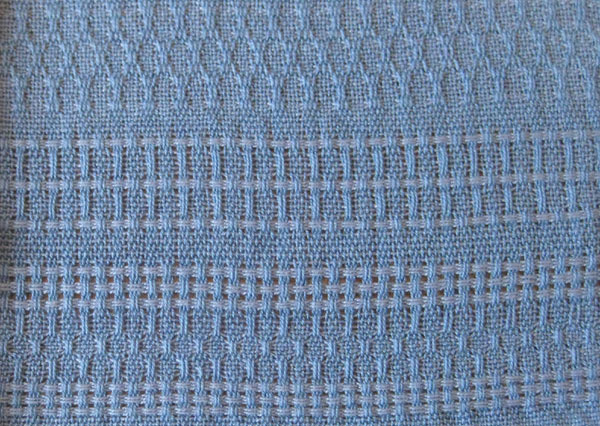 I did a little bit of huck when I first started weaving and, when I went from four shafts to eight, I loved all the extra patterns I could make by mixing up plain weave and the various huck options. 16 shafts is mindblowingly more powerful. My first attempt (still on the loom, below) is 50/50 huck and plain weave; changing these proportions is my main goal for this last little bit of the cotton warp. *but very amusing if you happen to be a cat. Yes, it is time for me to make up a few frivolous drafts myself. Thank you for the visuals. Love huck weave. 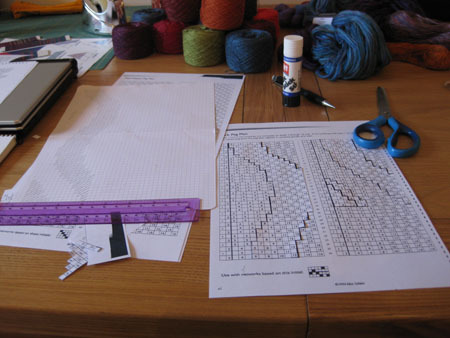 You are so logical with you explorations and weaving samples – with great results!